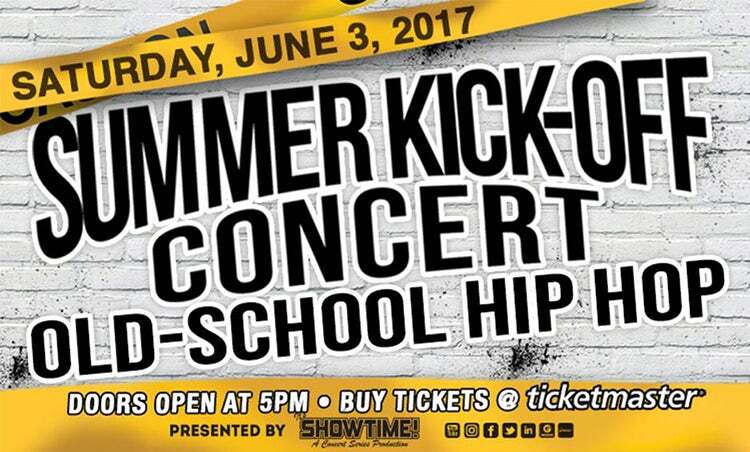 Wednesday, March 29, 2017 (Ontario, CA) – The concert event of the summer is coming to Citizens Business Bank Arena as IT’S SHOWTIME Productions presents the “Summer Kick-Off Concert” hosted by ODM from Lighter Shade of Brown and featuring DJ Quik, Kid Frost, Mellow Man Ace, JJ Fad, Suga Free, Paperboy and many more! “We are looking forward to the Summer Kick-Off Concert which is the best of the 90s’ hip-hop and rap performers” said Michael Krouse, President and CEO of Citizens Business Bank Arena. Tickets to this much-anticipated concert will go on sale to the general public this Friday, March 31st at 12p.m. at the Arena Box Office and ticketmaster.com. What: Summer Kick-Off Concert* featuring DJ Quik, Kid Frost, Mellow Man Ace, JJ Fad, Suga Free, Paperboy and many more! When: Saturday, June 3, 2017. Doors open at 5pm. Citizens Business Bank Arena, built and owned by the City of Ontario, operated by SMG, includes 9,500 fixed seats with additional “portable” seating risers to accommodate capacities of 11,089 for concerts, 9,736 for ice hockey or arena football and 10,832 for basketball. The 225,000 square foot venue features 36 luxury suites located on two levels and a continuous concourse hosting a variety of refreshment stands, merchandise kiosks, a VIP club and other fan amenities. Citizens Business Bank Arena hosts ice hockey, arena soccer, arena football, and a variety of other sporting competitions, concerts, family shows, special events, conventions, school and community activities as well as private events. The Arena is home to Ontario Reign, an AHL Hockey Team and Ontario Fury, a Major Arena Soccer League Team. Citizens Business Bank Arena is the biggest and most modern arena within the Inland Empire, an area with over 4.2 million people. It is located in the City of Ontario, on a 37-acre parcel located between Haven Avenue and Milliken Avenue, Fourth Street and the I-10 Freeway. For more information and future updates please visit: CBBankArena.com.